Other: sterols, reson, gum, a monocyclic C3l triterpenoid, and so on. History: The range of blue flag’s historical uses includes constipation and kidney problems. It was also used to promote saliva excretion, to treat recurrent vomiting, catarrhal sinus conditions, gallbladder and liver diseases, enteritis and recurrent gastritis, as well as heartburn. Blue Flag was also considered effective for migraine, induced by stomach conditions. Indians believed it to be useful for dropsy. Fresh leaves were occasionally used as a topical remedy for sores and burns. Used For: The herb is known to treat liver conditions, stimulate bile movement, fight constipation, increase metabolic rates, treat inflammations and induce urination. The plant is applied for skin conditions, particularly those induced by liver deficiency, as it helps the liver to flush away toxins from the organism. Additionally it’s applied for psoriasis, eczema and other skin diseases. 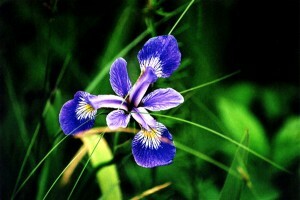 It is commonly applied as part of herbal therapies. The herb is applied to treat constipation induced by liver dysfunction and biliousness. Additional Info: Blue flag belongs to perennials and is indigenous to eastern areas of North America, wherefrom it is brought to Europe. The stem is thick and arises from the rhizome, covered with long, sword-formed leaves. The stems produce 2-3 purple or blue-colored flowers. Preparation and Intake: For a decoction, take one teaspoon of dry herb extract for a cup of cold water and boil it up. Leave on low heat for 10-15 minutes. Use thrice a day. In form of tincture the herb is taken in a quantity of 1 ml thrice a day. Commonly mixed with Yellow Dock, Burdock, and Echinacea. Safety: Warning! Blue flag includes a resinous component, called acrid, which affects the digestive tract, pancreas, and liver. It can lead to dermatitis in separate cases.